Temple of Trials is available from level 26. Click it so you can see what Temple of Trials is about. At first only Tier 1 is available to you, but in process of increasing others will be also available. Easy - Difficult - Nightmare - Hell. The higher level is, the award is more. To get to the next level, you have to satisfy a number of conditions. Each level has its own. Click on it to know what they are. Click "Clear Dungeon' to get to location. Inside you'll see a boss. Attack him/her to start a fight. During the fight you have to defeat 3 monster waves: 2 with ordinary mobs and 1 with Boss. Try to finish ech tier as fast as you can. You can receive 1, 2 or 3 star for passing. You receice 3 stars if you beat all 3 waves for 10 rounds. 3 stars allow you to open chests with additional awards. 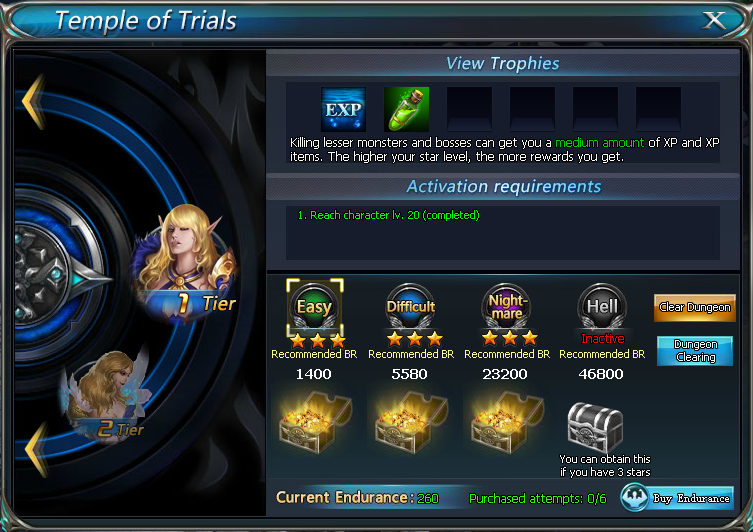 The main reward at Temple of Trials - Experience for the main hero, Experience objects for recruits and (at higher levels) Diamonds for improvement of equipment. For one attack you have to spend 30 endurance. If you're lack of endurance, you can buy it for gold or coupons. The higher your VIP level the more endurance you can buy. After you passed a certain level, you can't pass it again manually any more. To pass it automatically, press the Dungeon clearing button. If your VIP's lower than 5, then for completion of passing and receiving an award you have to wait, otherwise you will be able instantly to take away an reward. The more successful you're the higher reward you get. That means if you pass certain level at Temple of Trials for 1 star, when you do «Dungeon Cleaning» you get reward for 1 star. If you want to increase your level quickly, then Temple of Trials is the best place. Try to pass each level on 3 stars - it will give you the maximum awards.